the incredibly useful iPhone toys with the unfortunate names. d'Stand's graceful lines easily blend with any home or office setting. Your iPhone or other media device appears to float above your desk, always above the clutter, always within easy view and reach. Always at the perfect angle to see who's calling and for taking the call on speaker. When you use your phone for reading, emailing, texting, twittering, playing games or watching videos, your day will be a little brighter. Clean and Simple. No finger grippers, snaps, straps or other gimmicks to fiddle with! Tap, type and swipe as usual! Hands-free FaceTime with your iPhone 4! Holds device at any rotation - landscape for videos! Beautifully polished, rough cut, crystal acrylic with iceberg edge! Virtually indestructable. If it breaks, you get a new one! 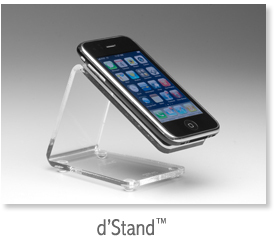 d'Stand is Apple's forgotten iPhone/Touch accessory! And, it makes a great rest for your tv remote! d'Stand holds your phone while you tap away as usual. Your free hand can now use this time to finally learn how to juggle. If most of your interaction now requires both hands - one hand holding the phone and the other hand doing the work, your day will get a lot nicer. d'Stand's perfect balance and padded surface offer secure, one hand-operation of your phone. It's almost like having a third hand, yet not being weird. Ever wish you could attach your iPhone to a real, full-height, camera tripod? Set it up on a desk or shelf for videoing or live broadcasting? Use it as a dashcam? Be part of your family photos and home movies? After dozens of design prototypes and months of testing, I came up with what I think is the perfect solution (if you like simple): an L-bracket, a threaded hole, and Velcro. Amateur or pro, if you're exploring the growing world of iPhone imagery and like taking photos and videos with your iPhone or other phone cam, d'Trod is the accessory you've been longing for. With d'Trod, TimeLapse, Duplicam and other great iPhone photo and video apps, you can bring wildlife up close and, finally, put you in your family's pictures and movies! d'Trod! New possibilities! New fun! Works with any tripod including the cool Gorillapod! Take steady, blur-free, macro closeups! Take long series timelapse photos! Connect your iPhone with your iPad for remote shots! Get closeup shots of birds, bugs, flowers! Set it on your dash for GPS driving, or a video or live broadcast dashcam! Hang it on your car's sun visor for hands-free calling! Set it on your desktop or a shelf and take unattended photos and videos! Use it with iPhone 4's FaceTime or your video blog. Simple & beautiful, d'Trod's made from the same high quality, crystal acrylic as the elegant d'Stand and works with all phones and cameras. 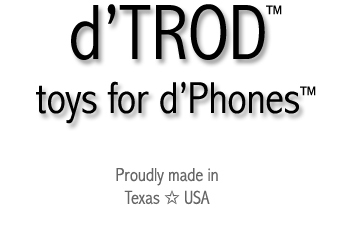 d'Stand and d'Trod make great personal gifts! Corporate logos and promotional messages can be expertly laser engraved for unique promotions! d'Stand: Certain hard cases, silicon?, do not hold and will not work properly. If your case holds on one of those non-slip, dashboard mats, then it'll work with d'Stand. Just in case yours won't hold, we've included, at no additional cost, an extra self-adhesive pad to put on the back of your device-it feels great and even adds a little extra grip. If you don't need it for your phone, just stick it somewhere you could use a non-skid pad, like your car's dash. 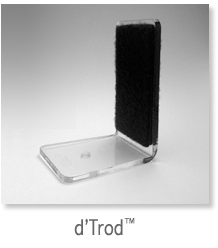 d'Trod: With the included Velcro pads, d'Trod works great with any camera or phone, not just Apple's! Proudly 100% Made in Texas, U.S.A.